Unless stated otherwise, all ORCW meetings are held at 7:30 pm at the Mountain View County office on the last Wednesday of every other month. Unless stated otherwise, all Olds Community Policing meetings are held at 7 pm in the Town of Olds Council Chambers. We salute our volunteers and say "Thank You!" Here is a list of the many individuals who are doing everything they can to maintain a safe community. Volunteer Appreciation 2017. Mountain View County and the Alberta Community Crime Prevention Association (ACCPA) collaborated to invite students from the University of Calgary and Mount Royal University to participate in a group project competition where they would document, analyze, recommend and present area and neighbourhood-based solutions to community safety challenges in rural areas using the County logistics as an example. The winners will be presenting to Mountain View County Council and the at the Alberta Community Crime Prevention Association Conference in May in Canmore. A student group has developed a questionnaire, for Mountain View County residents, specifically within the Water Valley Area, their message to residents is below. We would appreciate your assistance in participating in the survey and circulating if appropriate. Thank you for taking the time to read this. We are a collaborative undergraduate research group from the University of Calgary and Mount Royal University working in coordination with the Alberta Community Crime Prevention Association. We would appreciate it if you would take 5-15 minutes from your day and answer a survey regarding your experience with, and perception of crime in your community. Results from this survey will be used in a presentation for Mountain View Council and potentially the RCMP at the 2019 ACCPA conference in Canmore. Olds/Didsbury/Sundre Rural Crime Watch advises each of our members to review a video or two, or all of them (18), so that you are informed on crime prevention techniques to protect your farm and family from becoming a victim. CLICK HERE to see the latest videos today. 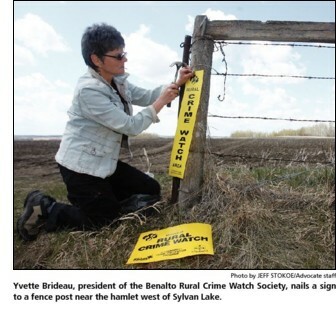 Farmers Advocate Office Cautions Landowners about Surface Rights use of "Condition of Leased Area Form"
Rural Crime Watch provides resources and reports occurrences of suspicious or unlawful activities to local RCMP, Fish & Wildlife officers, and other law enforcement agencies. The Olds Rural Crime Watch Association incorporated in 1981.